While nobody has verified that it is Priyanka Chopra’s form, it comes with the Baywatch actor’s passport-sized photo, her signature, and many other details. The world and its uncle have applied for Reliance Industries’ Jio connection. But is Priyanka Chopra — at present busy shooting for her ABC TV series Quantico in New York — one of the hopeful prospective customers? 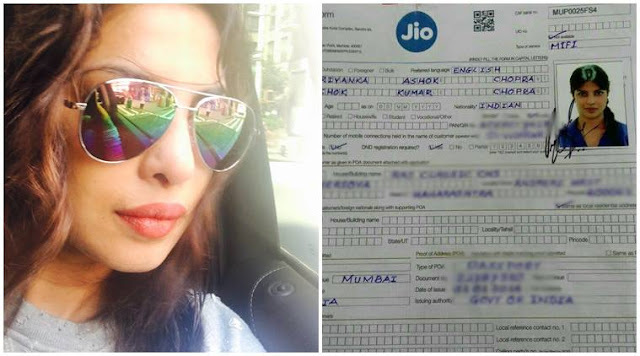 That is yet to be confirmed but it is not stopping people from sharing Priyanka Chopra’s alleged subscription form for the service on Twitter, Whatsapp and any other social media platform. In fact, so hard have people tried to share the form that it has achieved that nebulous currency, of being viral. While nobody has verified that it is Priyanka’s form, it comes with the Baywatch actor’s passport-sized photo, her signature, and many other details. Priyanka has not commented on the form or if it is really her’s yet. The actor has been in the US all this while, shooting for the show that will launch later this month. Quick to respond to buzz and rumours, no denial or confirmation has been forthcoming from Priyanka till now. Reliance Jio SIM card comes with the preview offer which gives users an access to free unlimited 4G data for the first three months. Users will, however, have to pay for Jio services from January 1, 2017.